All you need to know about sensors required for measuring different process parameters. Thermocouples are available in different combinations of metals and calibrations. J,K,T and E are the most common types. Other types like R,S and B are used for high temperature applications. Each type has its advantages and disadvantages, and thus, their applications vary. Let us discuss some of the types and their specifications. Widest operating range among all other types of thermocouple. Therefore, the most widely used thermocouple is type K.
Best suited for use in oxidizing or inert atmospheres up to 1260 ̊C. Should not be used in atmosphere containing Sulfur. Should not be used in partially oxidized conditions or where continuous oxidation-reduction cycles exist. As Nickel is magnetic, type K shows a deviation in output at its Curie Point, which is 350 ̊C. Drift rate of 1 or 2 ̊C (2 to 4 ̊F) occurs between 371 to 538 ̊C (700 to 1000 ̊F). Hence, mostly used above 550 ̊C. Thermocouple grade wire: -328 ̊F to 2300 ̊F ( -200 ̊C to 1260 ̊C). Extension grade wire: 32 ̊F to 392 ̊F (0 ̊C to 200 ̊C). Standard: + 2.2 ̊C or + 0.75%. 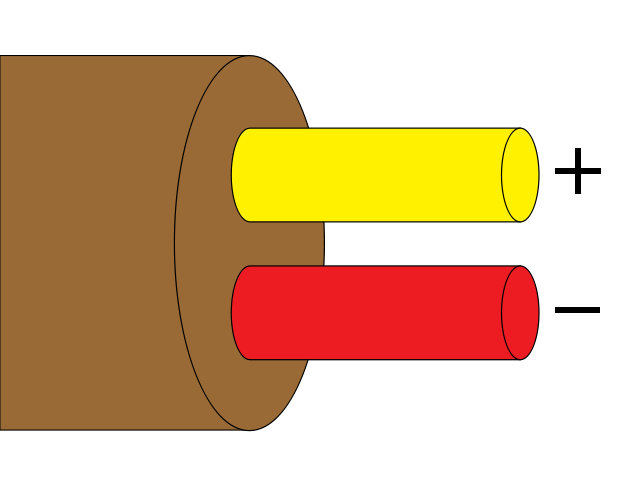 Positive leg is Yellow,magnetic and Negative leg is Red, partially magnetic. Positive leg: 90% Nickel, 10% Chromium. Negative leg: 95% Nickel, 2% Aluminium,2% Manganese,1% Silicon. Aging does not occur in this type, i.e. no drift, as against type K.
However, smaller temperature range and lesser life span at high temperature, as compared to type K.
Well suited to oxidizing atmospheres. Deviation in output occurs at Iron's Curie point, which is 770 ̊C. Bare elements should not be exposed to sulfur above 538 ̊C (1000 ̊F). Thermocouple grade wire: -328 ̊F to 1418 ̊F ( -200 ̊C to 770 ̊C). Positive leg is White and Negative leg is Red. Negative leg: 45% Nickel, 55% Copper. Recommended lead wires are same as constituent metals. Type E has the higher sensitivity, i.e EMF output per degree, than all other thermocouples. Hence, used in cryogenic applications. Higher accuracy and stability than types J and K at temperatures lower than 1000 ̊F. Recommended for continuously oxidizing or inert atmospheres. Type E, like type K, must not be used in atmospheres containing Sulfur. Thermocouple grade wire: -328 ̊F to 1600 ̊F (-200 ̊C to 900 ̊C). Standard: + 1.7 ̊C or + 0.5%. 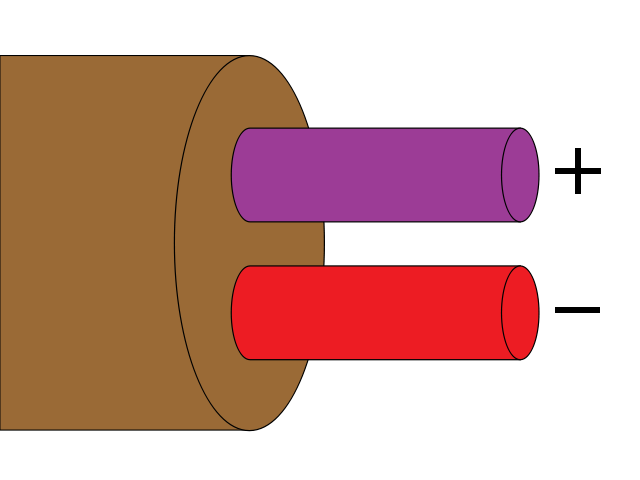 Positive leg is Purple and Negative leg is Red. Positive leg: 90% Nickel,10% Chromium. Same Accuracy and Range as of type K.
Better Repeatability and lesser aging between 572 ̊F to 932 ̊F (300 ̊C to 500 ̊C) than type K.
Higher oxidation resistance at high temperatures as compared to type K.
Greater stability in nuclear environments as compared to type K.
However, slightly expensive than type K.
Thermocouple grade wire: -454 ̊F to 2300 ̊F (-200 ̊C to 1260 ̊C). Positive leg is Orange and Negative leg is Red. Positive leg: 84% Nickel,14.5% Chromium,1.4% Silicon, 0.1% Magnesium. Negative leg: 95.7% Nickel,4.2% Silicon,0.1% Magnesium. Very high stability and therefore, it is used in cryogenic and ultra low temperature applications, laboratories,etc. Well suited for oxidizing atmosphere. Excellent Repeatability between -380 ̊F to 392 ̊F (-200 ̊C to 200 ̊C). Used for differential measurements as only copper wire touches the probes. Since both conductors are non-magnetic, there is no Curie point and thus, no abrupt changes in characteristics. Does not cause corrosion in moist atmospheres. Copper has high thermal conductivity and hence, special precautions need to be taken while thermally anchoring type T thermocouples. Thermocouple grade wire: -454 ̊F to 662 ̊F (-200 ̊C to 350 ̊C). Standard: + 1.0 ̊C or + 0.75%. Positive leg is Blue and Negative leg is Red. Recommended lead wires are the same as constituent metals. The types of thermocouples discussed above were used for moderate to low temperature applications. Now, let us discuss some noble metal thermocouples which are used for high temperature applications. Highest range of all thermocouples. Maintains high accuracy and stability even at high temperatures. Cold junction compensation can be easily performed. Has lower output than other noble metal thermocouples. Less susceptible to grain growth and drift. Easily contaminated and damaged by reducing atmospheres. Avoid using below 50 ̊C, as it gives same voltages for different temperatures. Thermocouple grade wire: 32 ̊F to 3100 ̊F (0 ̊C to 1700 ̊C). Extension grade wire: 32 ̊F to 212 ̊F (0 ̊C to 100 ̊C). Special limits of error: + 0.25%. Positive leg is Grey and Negative leg is Red. Positive leg: 70% Platinum, 30% Rhodium. Negative leg: 94% Platinum, 6 % Rhodium. Specialized for use in Pharma and Bio industries. Often used with a gas tight ceramic protection tube. Thermocouple grade wire: 32 ̊F to 2912 ̊F (0 ̊C to 1600 ̊C). Standard: + 1.5 ̊C or + 0.25%. Positive leg is Black and Negative leg is Red. Positive leg: 90% Platinum, 10% Rhodium. Specialized for used in laboratories. Higher percentage of Rhodium than type S. Hence, more expensive. High accuracy and stability at lower temperatures. Higher output and stability as compared to type S.
Thermocouple grade wire:-58 ̊F to 2700 ̊F (-50 ̊C to 1400 ̊C). Positive leg: 87% Platinum, 13% Rhodium. © 2017. TheSensorsguide. All Rights Reserved. Powered by Blogger.